My husband and I both are side sleepers. We both also use a body pillow to curl up to when we’re not cuddling with each other (which since he’s hurt his back, there has been less of that.) When I was given the chance to get him the Novosbed Adagio pillow to review I jumped on it in hopes that it may help him gain a better night’s sleep despite his back pain issues. When it came we opened up the package and right away he and Zeva were fighting over who the pillow was for. Of course, in the end he won since it got for him. She did get to enjoy it the first day we got it after we put a pillow case on it. Since the Adagio pillow made for side sleepers Del used it on the side to start with, but then I explained to him that it was made to support the neck and head he had Zeva try it out to see how it worked with her. She looked really comfortable and that made Del want it back even more. I told Del the big reason I got it is because it’s made to provide “contour-conforming support to the neck and head, while retaining a medium-soft level of firmness.” Del has used this pillow every night since we’ve gotten it. The pros of this pillow is does provide the support like it states it does. It definitely hasn’t lost its’ shape regardless how we’ve used it. Since you can get it for $149.00 it is less costly than its’ competitors. It does come with a microfiber cover that is very soft and uplifting. Since we live in a cinder block home, I personally love the fact that it is allergen and dust-mite resistant. Del loves this pillow and since we’ve received it he has received a better night’s sleep. He loves that it doesn’t fall off the bed as easily as his other pillows do. For him it conforms to what he wants it for. The cons for ME are that if you want a soft yet firm pillow this one is NOT the one for the job. To me it has more of a firm feel to it than a soft on. The covering on it is soft, but the pillow itself doesn’t give a whole lot when you apply pressure to it. The pillow keeps its’ shape so well that there is hardly any wiggle room to change its layout. This pillow is bigger than your standard pillow because it measures in at 22” by 16” (56cm by 41 cm.) It has an approximate 4” high. It is a hefty pillow weighing 3.5 lbs. Trust me when you’re trying to move it in the middle of the night when you’re half asleep you feel every one of those pounds. 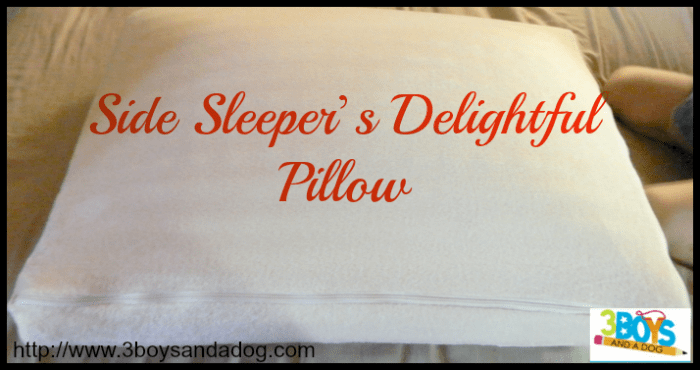 Since I pursued doing a review of this pillow for Del, it is definitely worth every penny. For him it gives him what he wants and needs. If I were to get a mattress from this company I would want one that has a bit of a softer and more giving feel to it than this pillow offers. The quality is definitely there and I can honestly say that it does live up to their Novosbed’s description of this pillow. You can gain more information about this pillow and other products that Novosbed.com offers by visiting their website. You can connect with them on Facebook, Twitter, and YouTube. What kind of pillow do you like the most? Thanks for this interesting post. Getting the right pillow will help side sleepers avoid neck pain, so it’s important.